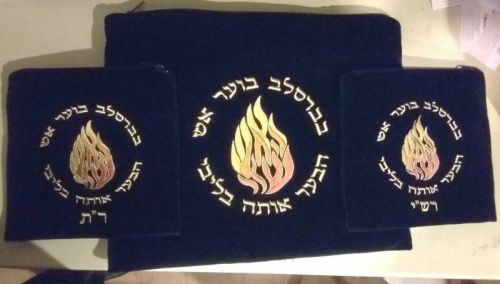 A matching set of three beautiful talis and tefilin bags with the inscription "BeBreslov boer eish"- a fire is burning in Breslov- referring to the spiritual fire that the Rebbe ignited. Embroidered on a high quality imported navy blue velvet ,it makes a striking impression.The talis bag measures 14"x18"- big enough to accomodate both tefilin bags which measure 9"x9" each.There are also two inscriptions on the tefilin bags designating one for Rashi's Tefilin and one for Rabeinu Tam's Tefilin. Also available individually by clicking on "Judaica". Please note that there is a substantial saving when purchasing the entire set.